In my opinion portable breakfasts are the holy grail of baking. I’m always looking for an energy-packed on-the-go breakfast, with plenty of healthy fats, whole grains and protein to tide me over until lunch. Dark Chocolate Peanut Butter Banana Bread was the first contender for the ultimate portable breakfast but these scones are a serious contender. I tested them out on the girlfriend and she approves. This recipe is at least the third remake: I found it on Bon Appegeek where it was adapted from Baking Bites. And yes, the dough looks and tastes like chocolate chip cookie dough and I was very tempted to eat it all raw. 1. Preheat oven to 400 degrees. Spray a large baking sheet with cooking spray and even it out with a paper towel. Spoon the flour into the measuring cup and add to a medium-sized bowl along with the sugars, baking powder, chocolate chips and salt. Lightly beat the eggs and milk in a small bowl. Place the banana in the 1 cup measuring cup and mash the banana with the back of a fork until no chunks remain. Add the banana to the eggs and milk and mix well. 2. Add the peanut butter to the flour mixture and work it in with your hands until very few clumps remain (if your peanut butter is not that runny then microwave in a bowl for 20 seconds). Add the egg, milk and banana mixture and mix together with a large spoon or by hand until it is evenly mixed. 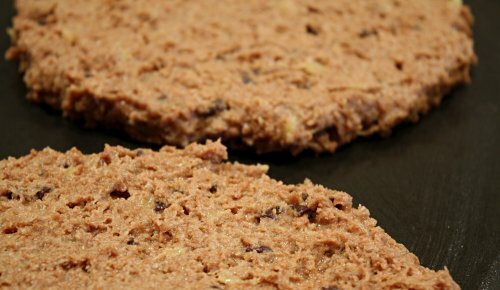 Scrape the dough onto a cutting board and split into two equal sized batches. The dough is sticky so use a spoon or butter knife to flatten the dough to form two discs about 7 inches in diameter and a little less than 1 inch in height. 3. Cut each disc into 6 sections and transfer to a baking sheet. Bake for 20 minutes or until the tops are lightly browned and a toothpick comes out clean. Top with strawberry jam or dunk in a cup of coffee! Makes 12 scones. Breakfast has never looked so decadent. Yum! woah! another great peanut butter recipe. Portable peanut butter perfection!! Loove scones. Looks fantastic. And breakfast IS the best meal of the day! Those look absolutely fabulous. I can’t wait to try them. That looks great! Scones are the best breakfast food! Yup, I think I would be more than happy with this for breakfast. I love scones so much, and now you have created a masterpiece with PB & choco in it. YUM! Not only do the flavors in these scones sound delish but I love the way it’s all put together. Two discs of dough instead of mixing chocolate chips in or something, who’dve thunk it? Ohh man I cant wait to make this.. when I go back to school in a month these would be great to have on the go when I need something after a workout but I have to go right to school! VeggieGirl, Love your term for it! Christine, Thanks! Although luring people in with peanut butter and chocolate isn’t so hard after all. Sagan, It’s true! Which is why these are the perfect nutritious breakfast to start your day right! Ari, Yes, it’s certainly a unique one. Although I gotta admit, next time I make it I’ll probably just stir some chips in to make it a bit easier. SportsNutritionLiving, I use these as a great power breakfast with a piece of fruit and dunked in some coffee before a workout. Nick, I love that you call them scones – so much easier for us easily confused Brits to understand. They look delicious, moist and decadent. The soya milk substitution for a large egg is about 60ml soya milk which you curdle by adding a dribble of cider vinegar or lemon juice and then leave to stand for a few minutes. This also helps the bicarbonate of soda to act and produces a lighter scone. Looking forward to the no bake exhibition, rolling my sleeves up as we speak. I really really need to try making a gluten-free version of this! I have been working on a biscotti and scones book (GF), and this is giving me ideas. Thanks! Looks great! My knowledge of pb is pretty average. I enjoy eating it but know little about the variations. Do share your findings. Your scones do look delicious. We’ve sent you an award. just found your blog today, love it! Those scones look so darn good! Naomi, Thanks for the tip, now if only someone can make them gluten-free they’ll be game for everyone! Mike, Let me know if it works out! Julie, Sorry to say it, but mine are probably better =). Meehee, Thanks! So glad I could be of help. Did you make it with choc. chips in the batter? How did it turn out? Mmmm, yummy. Yes it’s very tempting. I made these the other day following the recipe exactly. When they came out of the oven, they looked like charcoal briquettes. :( So I tried again, checking on them after 7 minutes. The bottom was already burnt, but the insides were raw. By now, it was me vs. the scones. So it’s been less than 12 hours since I made them, and I really HAVE eaten the whole batch. There was one thing I forgot to mention: instead of the weird freezing/scraping thing, I just microwaved the peanut butter for 30 seconds so it would be liquidy enough to mix with the other ingredients. It worked great. this is the best thing i’ve ever seen. i love sconesss (that’s me singing about how i love scones). thank you thank you. Yum! Looks like the perfect on-the-go breakfast! Well thank you! Have you tried any variations? I’m a scone-eating machine. These look wonderful. I love peanut butter scones, and with chocolate I can only imagine! I wonder how this would be if you used white chocolate peanut butter? Interesting, I have not heard of that brand. Had I known I would have picked some up when I was in Saratoga Springs a few weeks back! Scones are my FAVORITE pastry! I’m so making these! Do it! And let me know! oh baby, these look good! I am a big fan of scones, but I doubt I could eat these for breakfast. Something this decadent would be a weird and confusing thing to wake up to! You have it backwards Erin. This is exactly what you NEED to wake you up and get you out of bed in the morning. It will put that extra jump in your step and larger smile on your face in the morning! Besides, there is very little added sugar and it’s quite the perfect little breakfast in my opinion! haha, that is so true! it sure would motivate me to get up on time, perhaps even early! this looks so good– any other substitutions for ww pastry flower? would reg. do the trick? and id like to see a post on fast pb b-fasts for college girlzzz on da go! Regular flour would work, whole wheat flour would work too but you may need to add a bit more liquid, otherwise it should be fine! I’m always on the hunt for portable fast peanut butter breakfasts as well, I should really make a good compilation of some new and previous recipes! By the way, where have you been? I lost track of fellow foodies at the end and you just disappeared! Heck yeah, I’d love these! B-fast on the go, annnnd pb/chocolate at the same time? Yes, please! I made these with whole wheat flour (King Arthur organic) and they turned out really well. Thanks for sharing them! I’m glad you enjoyed them! Thanks for stopping by and telling me! Sorry I dont tweet yet. These look fabulous and I am going to try them. However, I was looking for a recipe that was PB and Butterscotch scone. I think I will replace the chocolate chips with butterscotch chips and see what happens. Maybe even crush a few butterscotch candies and put them in too. I had something like this in Durham, NC at Fosters 3 years ago and have never seen it since so I am desparate to do it myself now. Thanks for the recipe. If anyone tries the butterscotch first, let me know how it goes! Don’t be sorry you don’t tweet, it’s overrated anyways =). Cut the recipe in half and form 2 very thin disks of dough. Either but butterscotch chips in the dough first or melt some butterscotch (or use that caramel apple dip you see in stores) and spread it onto one dough disc and put the other disc on top. Then cut it into 6 scones and seal around the new edges so it doesn’t leak out. You could also mix the liquid butterscotch/caramel with more peanut butter for a superb filling! I have to admit I didnt think the PB and butterscotch could be improved on, but this sounds fabulous!!! I have to try this weekend! thanks for the extra mouth watering ideas. Sure thing =). You know, I actually have that caramel dip in the fridge, so if I can scrounge up the other ingredients I may be trying this myself – maybe even using caramel in the dough itself and decrease the added sugar…I’ll keep thinking on this!